Someone mentioned to me that they couldn’t understand the popularity of black and white bedding. I pondered the question a moment and it came to me that modern bedding sets that are printed in two colors HAVE gained in popularity. There could be several reasons for this decorating trend. As far as black and white is concerned simplicity and versatility would probably be at the top of the list of explanations. 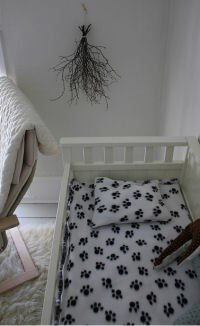 To call black and white baby bedding trendy would be a mistake. I would consider the monochromatic print a classic that reinvents itself in unique and different ways on a regular basis. When a particular fabric is in vogue, you can count on at least one offering in stark black and white. Whether the weave of the moment is canvas or damask, black and white will be on top of the trend in one pattern or another. The reason for this is that it’s possible to decorate using many different decorating styles using black and white bedding. You can take the decor in a modern direction with the clever use of accessories. Many times this decorative slight of hand can be accomplished using the very same set of black and white bedding! Any manufacturer that would ignore this decorating basic would be an idiot! The crisp design of black and white toile bedding paired with a nursery walls painted in rich oriental red would be the ideal centerpiece for a richly appointed luxurious room. Take the same toile print and coordinate it with black and white plaid, stripes or polka dots and there you have a baby room design that is casual, contemporary and lots of fun. Both black and white bedding for kids and baby crib bedding sets have been very popular for several years. Just when I think that nothing new can be done with it, an imaginative professional (or amateur) decorator puts up a gallery of pictures featuring beautifully decorated bedrooms that are unique and gives me inspiration to come up with my own nursery designs using bedding sets with black and white polka dots, stripe or floral print fabrics. Some clever animals and characters that have popped up on black and white bedding fabrics are penguins and panda bears. Babies love the precious baby animals that are naturally black and white. 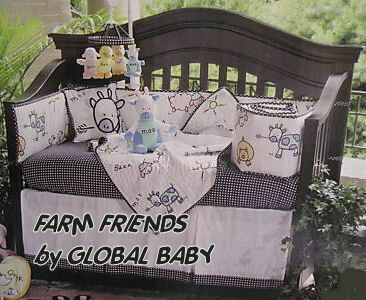 These baby bedding fabrics are very popular with parents that want to raise environmental awareness. For eco-minded parents, there are some really cute black and white baby crib bedding sets featuring pandas and penguins. Make plans to visit our site often to see pictures of baby nursery themes decorated in a black and white nursery color scheme. 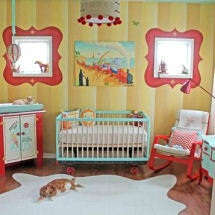 Unique Baby Gear Ideas has many articles and DIY decorating projects that you can use to design your own baby's room.